Since the spring of 2016, Center for Moms hosts its free monthly workshops for moms at Fitness Center FunFit in Belgrade. In March 2016, Center for Moms organized Mom’s Balanced Day workshop where moms learned how to form and maintain their daily routine. Certified personal trainer, Tamara Vujnović helped moms to discover all those seemingly small things and feelings that are actually very important for every mother, child, and their mutual connection. In April, we organized a workshop How to Become a Better Mom – Both to Your Child and Yourself. 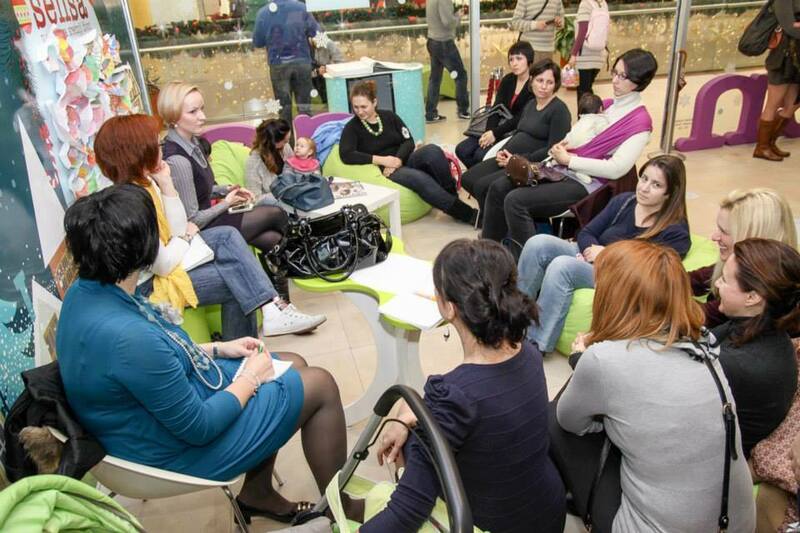 The leader of the workshop was Ivana Kuzmanović, a writer and a life coach, who gave answers to all the questions moms had. The important part of the workshop were energizing techniques for moms to learn and apply during the hard and stressful times. Since 2013 until 2016, Center for Moms and Shiva Shakti Yoga Studio successfully cooperated and organized a great number of workshops. Shiva Shakti also holds numerous activities for mothers and expectant mothers on its own. Personal and Family Organization – Technique One can Learn is a workshop for anyone who wants to be better organized in order to accomplish more and achieve improved life quality. ZoranaVujić (Masters in international management, professional organizer, and editor-in-chief of “Helperka” website), offered to assist moms by showing them how to plan, find what they have lost, and how to make time to attend those ever important life events. Participants were tested to assess their organizational personality types. They could then apply certain organizational rules, adjusted to their type, to achieve maximum results. Baby Massage, dedicated to parents, expectant parents, all health care workers and therapists who deal with babies, teachers, educators, yoga instructors, masseurs, and anyone wanting to promote healthy relationships with children, from a baby’s first day. The workshop was conducted by MarijaNakić, the only instructor licensed by the International Association of Infant Massage in Serbia. Ivana Kuzmanović has also conducted A Parent on Two Levels workshop where she reminded and drew the attention to the fact that moms need to love themselves first in order to be able to unconditionally love their children. Natural Parenting Workshop was organized jointly with The Power of Birth Association and Natural Parenting Center. Moms had the opportunity to get to know something more about the latest scientific information regarding psychological, emotional, and intellectual child development, and what should a parent do to give their child what it needs. Olja Ivanović (mom, psychologist, parenting counselor, marriage and family therapist and Natural Parenting Center Serbia founder) explained why the first years of life are the most critical; what it actually means to spoil a child; how significant it is to know how to set boundaries, and provided a question and answer opportunity for participants. Family Without Chemicals was a workshop conducted by Olga Barnak (psychologist, mother of two children who have never been ill, and a woman whose goal is a natural and healthy life for her family). Olga presented numerous natural alternatives to harmful agents which come from the chemical and pharmaceutic industries. She discussed methods to avoid allergies, different diseases, and obesity among children. We have organized the workshop together with The Power of Birth Association. How to Fall in Love with Yourself and Stay in Love Workshop was held by Sanela Feković (life coach, psychologist and systemic family therapist—by Bert Hellinger, VladaIlić’s student and an active member of Association for Systemic Therapy and System Solutions Serbia). Sanela has studied movement and sound. These studies gave birth to the Dance of Shadows Method which awakens patterns of (no) love of mind, emotions and body that lie in the shadows. This workshop was also organized jointly with The Power of Birth Association. Active & Healthy Mom is a workshop that discussed the importance of exercising, staying active, and maintaining a healthy diet. This workshop was organized together with Active Life Association. Body & Mind Awakening, Warming-Up, and Short Exercise Kin-Jo (the source of the movement), the consciousness martial art which unifies yoga, acupuncture, energy medicine, and the Ancient East martial arts. This class was conducted by Tanja Jovanović, authorized Kin-Jo trainer, and one of the four Kin–Jo trainers in Serbia. Family’s Future Financial Planning addresses questions such as: Should we try to save money? How to do that? What kinds of savings there are? How to save during crisis? What are investment funds? How do they work and how to distinguish them? The workshop was organized in cooperation with Concepts for Life Association. Sensa Happy Town hosted two Center for Moms‘ workshops in December 2013 and January 2014. Happy, Nurtured and Healthy Moms and Babies explored proper facial and body care, from pregnancy to breastfeeding. We also discussed how to treat and care properly for a baby’s skin. Moms had the opportunity to hear experiences from two moms, who are experts in their fields. Olivera Beader is skin care expert advisor for the company Oriflame for many years. Sonja Dakić is a successful entrepreneur who has created her own brand of bamboo cloth diapers—DAJ DAJ. The first activities Center for Moms hosted were exercises and workshops for moms, free of charge, every Saturday in July and August 2012 at Kalemegdan. After attending classes in yoga, pilates, boot camp, or cross fit, moms got the opportunity to attend short, educational workshops that offered answers to many questions: how to communicate with children, how to avoid conflicts in the family, how to maintain a healthy diet, how to exercise with children, and so forth. Workouts were run by the well-known Serbia trainer, Goran Vekić, whereas workshops were conducted by the leading experts in the respective fields. Fitness club, Green Zone, helped organize exercises.